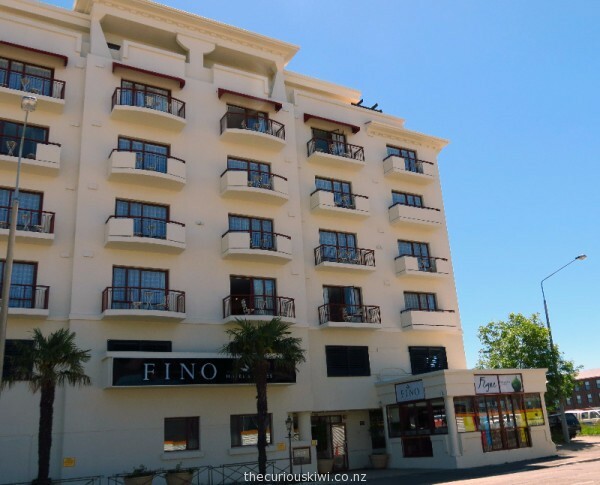 The newly refurbished Fino Hotel & Suites has two dedicated pet friendly suites for house trained pets under 50kg. They supply a bed, water bowl, and for those taking man’s best friend, a map of local dog parks. See Pet Friendly Suites for more information. (PS. Scenic Hotel Te Pania in Napier is dog friendly too). Local company SmartCross are responsible for the devices with touchscreens that are attached to the traffic light poles on Lichfield & Colombo Streets. You can play Pong while you wait for the pedestrian crossing. When I saw the segment on TV 3 I wondered what happened if there was no one on the other side of the street, easy, you can play against the computer. Will there be a love story that starts …. “We met playing Pong on the corner of Lichfield & Colombo”. PS. If you want some practice play Pong online. 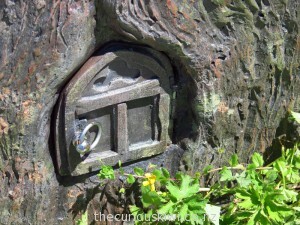 Kids will love the fairy door in the Restless Forest on Cathedral Square. Every time the forest moves a new chapter is added to the Restless Forest blog along with a new colouring page. Greening the Rubble initiated the story telling garden, follow the link to find out more and to check the whereabouts of the little forest. (PS. The fairy door has been used as a Gap Cache). The brilliant Margaret Mahy Family Playground opened in December 2015. 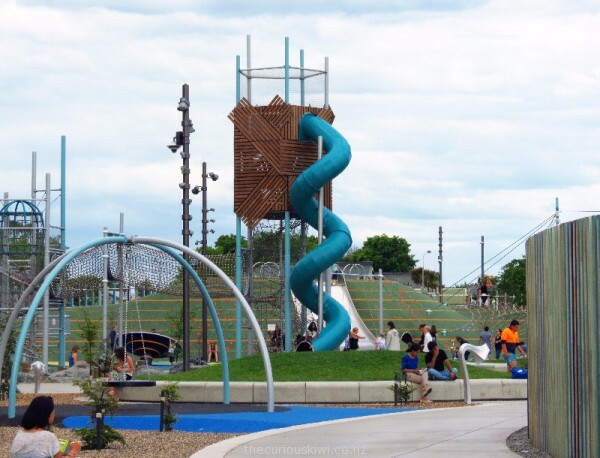 Named after the popular children’s author, the playground has plenty of cool play equipment – a flying fox, interactive water features, climbing nets and unusual slides. Mocoffee cube is onsite as well as a gelato and ice cream caravan. Opposite the playground is East Frame, a residential area that will eventually house over 2000 people in around 900 homes. The development will cover 14 hectares and as well as homes, will have cycle paths, a park and community gardens. The public spaces should be completed by early 2018, no time frame has been given for the homes. 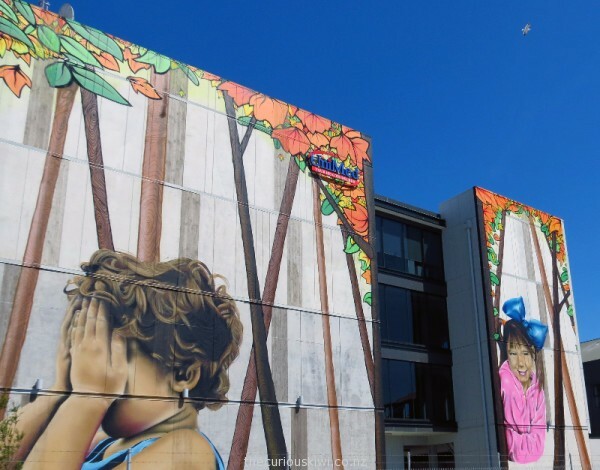 Watching over the development are ‘Lacy and Sol playing hide and seek’ by graffiti artist Wongi WIlson. 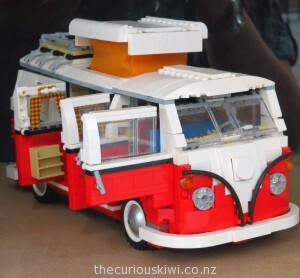 Walking through Cathedral Junction, a Lego Ghostbusters ambulance and a VW Kombi caught my eye. The neat Lego creations are in the window of Imagination Station, a not for profit play and education centre with piles of Lego to play with, free of charge. I chatted to a young man holding a Lego electric guitar he’d made, I thought that was impressive enough, but then he told me that once it was programmed he could play it, blimey! As well as Lego bricks, there are 12 iMacs used for classes in robotics and digital Lego design. 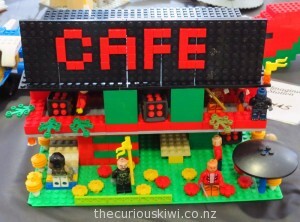 For adults there are Build and Build nights, 27 year old Tomas built the Lego cafe below. Donations help keep the Imagination Station open and are gladly accepted. Open daily, 10am – 6pm. (PS. If you’re into old school games have a look in Blast from the Past at 111 Worcester Street). If you want to hire a cool car to cruise around Christchurch we saw a red 2015 Ford Mustang Convertible parked in a Europcar space at the Airport. (Note: The Mustang we saw was a 2.3L EcoBoost, not a V6 or V8 and that might matter to some). 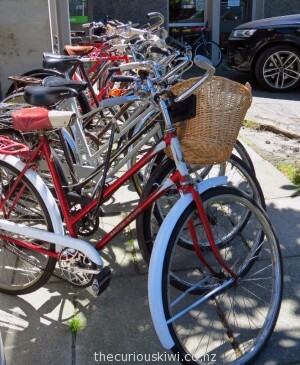 If you prefer pedal power, The Vintage Peddler at 75 Peterborough Street has vintage bikes for hire, from $15 for two hours. 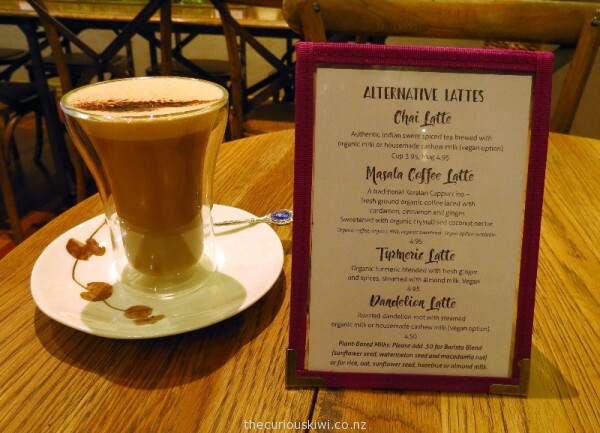 I’m not sure if tumeric lattes have made it to Rotorua yet, but they’re on the latte menu at The Lotus Heart along with dandelion latte, chai latte and my choice, masala coffee latte. The masala latte is made with organic coffee, cardamon, cinnamon, ginger and organic crystallised coconut nectar. It sounds nice, and tastes nice too – smooth, spicy and a little bit sweet. At $4.95 it’s not much over the price of a regular coffee and it was good to try something different. If you like fermented beverages, kombucha, and sparkling rhubarb and elderflower kefir are also served. If you’re looking for some peace and quiet The Lotus Heart is also a relaxing, and pleasant place to be. Cheers to Christchurch and to trying something new. 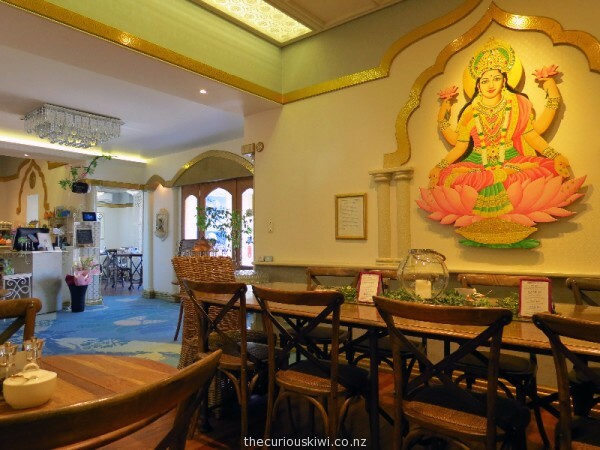 This entry was posted in Curious Christchurch, Unusual New Zealand and tagged curious Christchurch by thecuriouskiwi. Bookmark the permalink.